Oldsmar Cares is regularly seeking donations to help replenish our clothes closet and food pantry. Organizers of Perfectly in Place collect client donations for us while they de-clutter and organize their home or business. Less than three miles from Oldsmar Cares, Bayside Church is committed to serving their neighbors. Because of their partnership, Oldsmar Cares has increased food storage capacity to provide a larger selection of fresh meat and produce to families in need. Metropolitan Ministries provides Thanksgiving and Holiday meals to Oldsmar residents. The City of Oldsmar provides kiosk space to Oldsmar Cares for distributing information and to collect food and monetary donations. Oldsmar also donated 24 recycling bins to Oldsmar Cares for use in food donations, and has provided donation sites in city buildings including; City Hall, Oldsmar Public Library, Cypress Recreation Center, Oldsmar Senior Center and Oldsmar Fire Station. Earth Fare provides organic and whole foods to Oldsmar Cares on a weekly basis. At the heart and soul of what makes Earth Fare different is a set of rules that help them select the food they bring to your table. 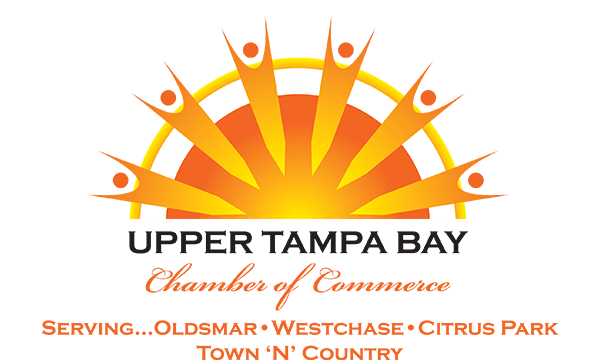 The Upper Tampa Bay Chamber of Commerceallows Oldsmar Cares to participate in chamber events at no charge. They also provide event and ongoing publicity via their chamber enewsletter. This support helps us to distribute information, hold fundraisers and accept food and monetary donations. The Nielsen Companydonates printed materials and mailings for Oldsmar Cares at no cost. They also host annual corporate events, where Oldsmar Cares is allowed to showcase its mission and raise funds for local projects. The church was the original site of Oldsmar Cares. It includded a food pantry, clothes closet and monetary disbursement of funds for rent and utility assistance.It is also the site of the annual yard sale. Donations of food, clothes and money can be made at the host site as well. ​Oldsmar Cares receives training, advice and support from this Pinellas County Government agency. The Feeding America network is a national organization, with regional food banks which support local food pantries. The Oldsmar Cares food pantry is served by the Pinellas/Clearwater food bank. Oldsmar Cares is allowed to purchase food from this organization at significant discounts. There are many services that we do not offer. For many of them, we refer people in need to the NFC, located at 1001 Dr. Martin Luther King Jr. Street, Safety Harbor. The staff at Neighborhood Family Center also provides guidance in running a non-profit organization. Each week 7-11 of Oldsmar donates excess food from their store to Oldsmar Cares which we provide to customers of the food pantry as a supplemental food source to the non-perishables in stock. Thorntons donates food from their Oldsmar store to Oldsmar Cares every week. This food is a great addition to the non-perishable food items. ​Dynametmakes monthly donations of steel-toed work boots to assist local residence in need of safety footwear. Publix of Boot Ranchhas been an ongoing friend to Oldsmar Cares. Whenever there is a need, we can count on manager Steve Jarrett to lend a hand. From helping with items for our Thanksgiving boxes for our food pantry customers to supplying specific need items when we have shortages to creating beautiful flower arrangements for our gala, we know we have a Publix partner. Each year in November the Boy Scouts and Cub Scouts in Oldsmar have an annual food drive with the donations picked up and delivered right to Oldsmar Cares. The Rotary collects food from participants of their annual Armadillo Run in March and donate it to Oldsmar Cares. They also make monthly deliveries to our food pantry from food and monetary collections at their weekly lunches. ​​Starbucks of Oldsmar provides donations three times a week of a variety of pastries, sausage, cheese and fruit prepackaged items. Oldsmar Cares is proud to be a member of the Tampa Bay Harvest food bank network, receiving food distributions from TBH several times each year on an as-needed basis. The Dancing Goat provides fresh eggs and dairy product donations weekly.